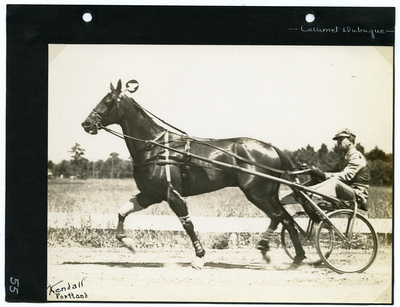 Black and white photograph of bay gelding, Calumet Dubuque wearing head number four, Gibbons up at the Gorham Fair Association races at Narragansett Park, Gorham, Maine, Thursday, July 7, 1938. Calumet Dubuque claimed the win in all three heats of the 2.14 Trot. The photograph is signed in the lower left corner by photographer Guy Kendall.